Empower your associates to deliver service that will impress today’s demanding and technology savvy customers with the MC40. The MC40 offers a cool, sleek design that rivals the most popular consumer-style products on the outside and pure business on the inside — enterprise-class durability, security and a comprehensive set of features including advanced bar code scanning, push-to-talk and an integrated magnetic stripe reader. The result? Associates can look up the answer to practically any product question, present product comparisons to help with a buying decision, place an order for next day delivery or in-store pick-up and ring up a sale — all without ever walking away from the customer. 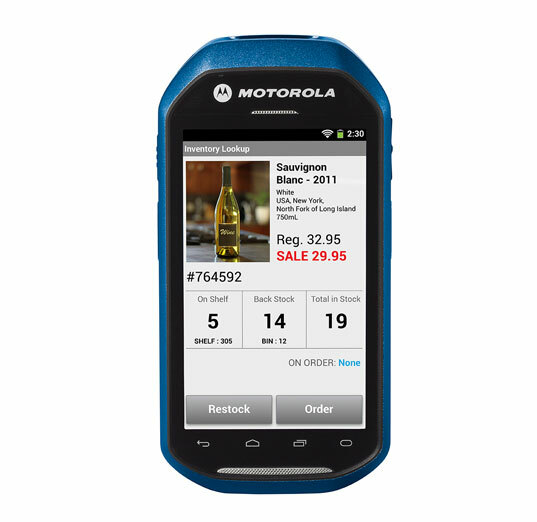 You get the durability that Motorola Solutions is famous for — the MC40 simply works, even if your employees drop it, bump it or use it in a dusty backroom. A series of new features transform Android from a consumer operating system (OS) to a true enterprise-class OS. An 800 MHz processor, 8GB Flash memory and support for 802.11a/b/g/n wireless LANs provide desktop-like speed for demanding applications. The generous display size provides the screen real estate to support information-intensive applications, such as product comparisons. The integrated magnetic stripe reader allows associates to scan a credit, gift or loyalty card. And with an encrypted head, information is never visible in the clear, helping meet PCI regulations. Pick the color for the bezel and add your logo to promote your brand. This enables customers to instantly identify your associates and discourages device theft.